LastFM, Pandora are nice. Musicovery is astonishing. LastFM and Pandora have gotten much deserved attention. And, i’ve been pleased to enjoy them…all the while discounting the fact that LastFM seems like too much comittment and Pandora is more complicated than it needs to be for what you get. Playing with Musicovery once, it’s clearly something different. Check it out. You think you know what it does, and then it does something else. Del.icio.us users are saying…(the French is pretty self explanatory). 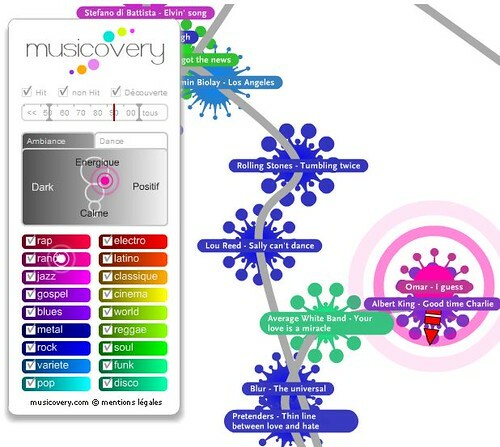 Great music discovery concept. It’s in French though.